Firstly let me start of by saying Happy New Year!! Wow, what a year 2016 was, some highs and some low lows but we made it! I’ve started a new job and introducing a new outlook into my life which is partly the reason why I’ve been slightly MIA but I’ll touch upon that another time. As I move into my 6th year (yes 6th year) of blogging I’ve been reflecting on what 2016 did for me in terms of blogging. Now, I’m not gonna lie blogging was slooooow for me last year, my head wasn’t in the game, but that’s another subject I’ll save for another time. In spite of that I picked up on some pretty cool things last year that I absolutely loved and which ultimately what kept me going when times got a bit crap. Here are 5 things that I really love about being a blogger and that I experienced last year. 1 – Blogger/Social Media Friends – Possibly one of the best parts about blogging. The people you meet and the people who become a big part of why you continue to blog. When I started my blog making friends was not really something I thought of, I just decided to type one day and that was it, my blog was more of an outlet for what was going on in my mind and my likes at the time. Skip forward 5 years with the inclusion of blogging events and now here I am with a new bunch of friends, most of whom I met this year due to facing my fears and getting out there to actual meet new people. Bloggers like Jess, Leslie, Steph, Jo and Liv all of whom I’ve met in the last year or so! My Girls On The Ground group who are all fantastically awesome and talented, the list goes on! I also have social media friends who show support whether by liking my Instagram pictures, RT’s my posts on Twitter, leaving comments of support on my YouTube or by just reading my blog, These peeps are the reason why and how I keep on going! With the beauty blogging world becoming more and more saturated I admit I feel like a small fish in a big pond but to see people interacting with me and comments of happiness when I release a video – it feels great and makes me feel like yes, you’re doing the right thing Natalie! 2 – Learning New Skills – One thing I did not see coming was a new skill set from blogging. I have learnt so much from being a blogger! I’ve learnt how to take product pictures, the basics of photography (still learning), how to present on camera (shout out Yahoo UK), how to edit videos and even improved my makeup skills since starting my blog. I’m now on the way to learning and gaining some networking and socialising skills, I am also about to begin the process of improving my writing and organisational skills. It’s slightly crazy because you never really realise you’ve developed new skills until you take the time to sit down and think about it. Most of what I’ve learnt has come from trial and error (mostly error, haha) other bloggers, YouTube and the great ol’ world wide web. If you want to learn a new skill I’d say don’t just stick to the books, especially if you’re a visual learner like I am, watch and put into practice. You wont be fantastic at it first time around but they ain’t lying when they say practice makes perfect and each time you practice you’ll get one step closer to perfect. 3 – Events, Brands and Products – Probably some of the most attractive aspects of being a blogger. Yes, you do get to attend events, work with big brands and from time to time you receive free products. It is pretty awesome! Now, this isn’t all what blogging is about and if you start blogging for these reasons alone – you aint gon’ make it. For me, I put in years of work, improved my skills, tried to be more consistent and worked on my social presence. In one sentence that may not look like a lot but it’s 5 years of work, sacrificed weekends and very very late nights. Luckily now I am invited to some, not a lot, but some events and they are pretty cool. To be honest, it was only last year where I decided I would start going to events instead of bailing (I find social events intimidating, you’ll find most of us bloggers feel or have felt the same way) and I haven’t looked back! I’ve been to events run by Urban Decay, John Lewis, Debenhams, Makeup Revolution, Roger & Gallet (the most beautiful event) and The Body Shop! I’m a forever grateful for every invite. Leading on from that you get to work with some pretty well known brands and develop relationships which is great for the event, yourself and for networking. When brands or PR companies become more familiar with you they may send you products to review and/or promote. These products are usually free which is also pretty awesome and when you work with brands and establish yourself a bit more, you can also charge for these reviews or ads. I mean, it’s kinda cool really when you think about it! 4 – Accomplishments – This is the part of blogging which for me, makes all the hard work worth it. Anything from gaining a new reader/subscriber to a brand wanting to work with you. I’ve had too many accomplishments to date, I mean, wow! When someone contacts me for advice regarding lipstick or says they bought a product they love because of my recommendation I feel great! It’s a lil accomplishment for me as I’ve been able to help someone! These accomplishments have kept me going all these years and will continue to do so. Each accomplishment is personal to the blogger but either way gaining one is a celebration in itself! 5 – Being Able To Do Something You’re Passionate About – It’s rare for someone to be able to do something they are passionate about, let alone do it and get paid for it. Being a blogger requires passion to keep you going and I’m forever thankful that I am one because I AM truly passionate about it. I count myself blessed to have all the perks listed above as well as being able to turn my hobby into so much more. 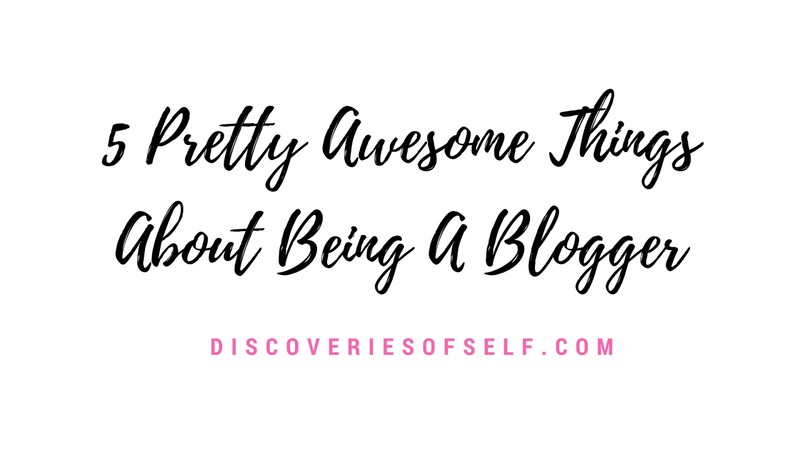 I have more plans for DoS so I hope you will stick around and if you’re thinking of becoming a blogger or even a vlogger, I hope this post helped sway you towards taking a jump and doing it! Thank you so much for all of your support so far even if you are just reading this!